Every region of the country has its own brand of severe weather that homeowners and business owners must always be prepared for. The East Coast and Southeast must watch out for hurricanes, the Midwest and Great Plains have tornadoes, and the Southwest must endure monsoon season. One type of storm that people living in the northeast U.S. need to watch out for is nor’easter storms. Nor’easter storms, as the name suggests, are storms that affect the northeast from Washington, D.C. up to New England with strong winds and heavy rain or snow. It is common for these storms to cause considerable property damage from the strong winds as well as flooding from the heavy precipitation. Residents and businesses in the areas most vulnerable to nor’easters must be aware of their risk and know how to prepare for these storms. 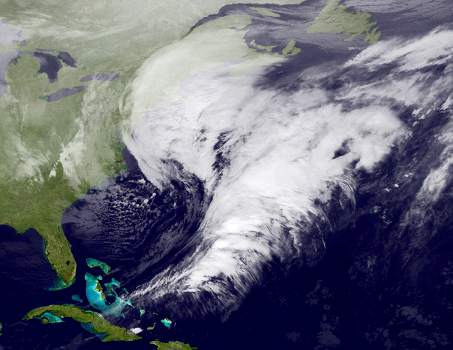 Satellite image of an approaching nor’easter. A nor’easter is a storm that forms when cold air moving southeast from Canada is met with warm air moving northward from the Gulf of Mexico. The combination of cold air over land and warm air over the ocean creates the low-pressure conditions in which these storms form. Nor’easters typically form between Georgia and New Jersey, no more than 100 miles inland or 100 miles out in the ocean from the East Coast. These storms then move up the East Coast and increase in intensity until they reach the northeast region of the U.S. As mentioned above, nor’easters consist of strong winds and heavy precipitation, either rain or snow, that is dumped on the affected area. 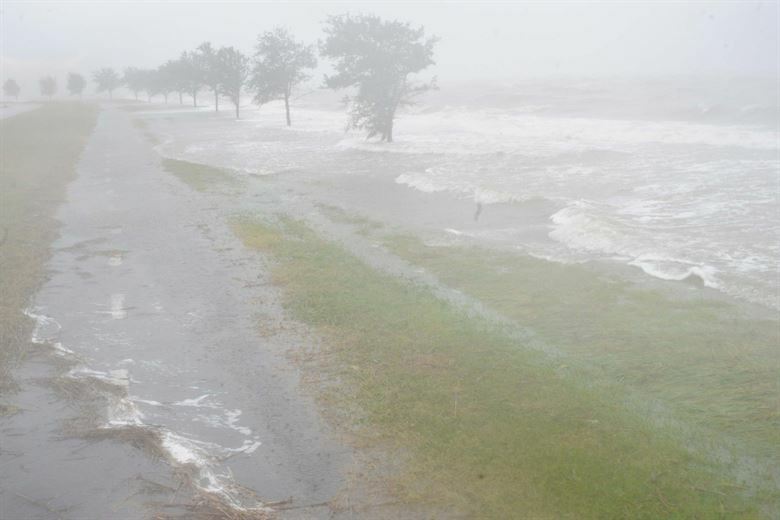 The strong winds also cause rough seas which often leads to coastal flooding. Miller Type-A: The Miller Type-A, or classic nor’easter, forms either along the Gulf Coast or East Coast and moves northeast. Miller Type-B: This type of storm forms inland over the Midwest and moves east over the Appalachian Mountains. The storm loses some of its low pressure when it crosses over the mountains, but it redevelops its low pressure when it hits the East Coast. From there, it moves up along the coast like a classic nor’easter. Flooding from the excessive rain of a nor’easter. Nor’easters are known to last for several days and the severe winds and snow or rain can cause significant flooding and property damage. The region most vulnerable to these storms includes heavily populated metropolitan areas such as New York City, Philadelphia, Washington, D.C., and Boston. Residents of these areas must always be prepared for the possibility of a nor’easter and know what to do when one occurs. The following tips will help prepare for a nor’easter and get through the storm with limited damage. Pay attention to warnings concerning the weather, you can download weather apps to get alerts when a storm is forming. Know the flooding risk of your property. Form an emergency plan that you can put into action when a storm hits. Your plan should include evacuation of the area if you live in a flood zone or a hurricane evacuation zone. Put together an emergency kit with supplies. Be ready for power outages by purchasing a generator and keeping fresh batteries in smoke alarms and carbon monoxide detectors. Take photos and videos to document your property before any damage occurs. If you live near the coast, do what you can to reduce the risk of flooding or flood damage to your home. Consider getting a flood insurance policy because typical homeowner’s insurance does not cover flood damage. Listen to local news or the National Oceanic and Atmospheric Administration (NOAA) for the latest updates. Follow instructions that are given to the public. Review your emergency plan; get ready to evacuate if you are in a flood zone or gather supplies if you plan on waiting out the storm in your home. Be ready to lose power. Make sure your cell phones and electronics are charged and that you have enough supplies to survive several days without power. Make sure your car has a full tank of gas. If you own a boat, get it out of the water and store it somewhere safe. Put outdoor objects like trash cans, furniture, and toys inside or in a shed or garage. Clean out your gutters to ensure that rain water drains properly off your roof. Close the storm shutters or cover your windows with 5/8” plywood. Turn off any propane tanks. Check your sump pump and lift items off your basement floor to prepare for potential flooding. Turn off the gas and electricity if advised to do so by public safety officials. Do not tape your windows. Taping can result in big shards of glass. Try to stay indoors and do not drive during the storm. If you must travel during the storm, do not walk or drive through moving water. Keep listening for updates on the storm and follow public safety instructions. Evacuate immediately if advised to do so. Bring your emergency kits and your pets. If advised to remain home, stay away from windows, keep listening for updates, and be ready to evacuate if conditions change. 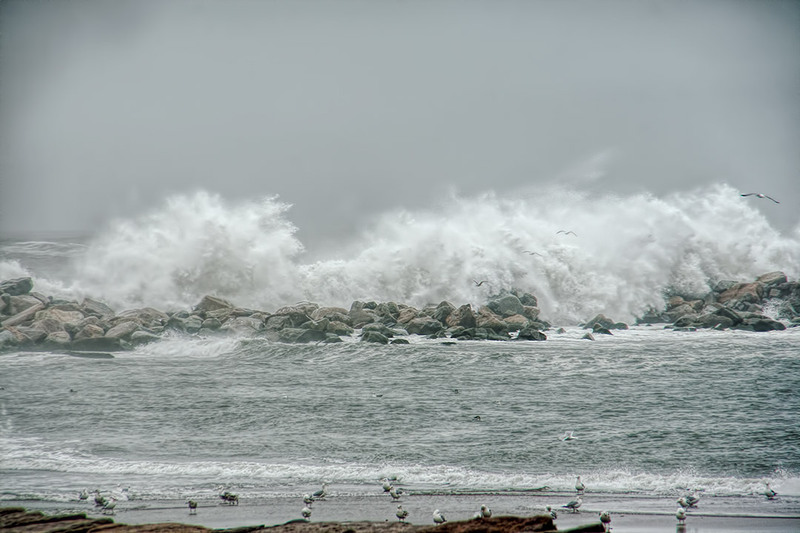 The winds of a nor’easter can cause rough seas. Keep listening for official updates and news and follow any instructions. Call 911 for emergencies and 211 for shelter information. Avoid downed power lines and call 911 to report them. Avoid driving or entering damaged buildings until the authorities declare that it is safe to do so. If you evacuated, do not go back home until the authorities deem it safe. Listen for reports about the safety of the water supply. Boil your water before use until the authorities announce that the water is safe. Carefully check your home for damage and try to avoid electrical equipment and standing water. Take photos or videos of the damage for your insurance claim. A storm damage restoration professional can safely assess the damage and begin the restoration. If the power is out, report the outage to your utility company and keep your carbon monoxide detectors working. Reach out to friends and family to let them know you are ok and to check up on them as well. Watch out for debris indoors and outdoors so you don’t hurt yourself stepping on sharp objects. Avoid contact with flood water because it could be contaminated. When a nor’easter occurs, your main priority is to make sure you and your family are safe. Once the storm has ended and you and your family are secure, you can turn your attention to your home and take care of any property damage. Severe storms and flooding can cause extensive, complex damage that is best handled by a restoration professional. These professionals provide complete storm and flood damage restoration services and can handle just about any type of damage caused by major winds or flooding. You must react quickly after a storm to begin the restoration because the longer you wait, the worse the damage will get.